Towards the end of the training, Kerri applied for another grant. She saw the importance of educating her kids on how to make good food choices by engaging them in food preparation. She used the second grant to renovate outdated food preparation and storage space at her center. She also had the counters and drawers adjusted to accommodate the children so they can help wash and prepare the fruits and vegetables from the garden. A few years later, Kerri applied for a Farm to School grant program which included education materials for the children and staff at her center. The grant money helped pay for the educational supplies and other lucrative equipment that involved healthy eating. 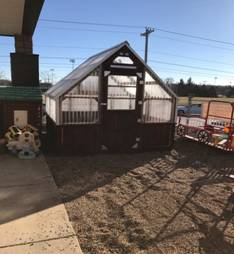 Kerry already had a garden so she decided to put the money towards a new greenhouse. Kerri is an exemplary leader who has taken the initiative to find and write grants so her center can eat better, save money and have fun. Marc Goeglin’s initial goal was to implement family style dining into the program, but he began to think of a fun and interactive way to introduce new foods to the children. With a combination of unusual foods and a rainbow of colors, this concept book shows that not all foods have to look the same way.